Through the eyes of Ruby? Today, I was puttering around my usual internet haunts, and saw a discussion thread about a new show on the Style Network: Ruby. This woman is really quite beautiful, with an attractive smile and Southern twang to her voice. She’s also almost 500 pounds. Actually, I think it’s 487, but the TV spots say 500 for sensationalism. At first, I was almost happy– could it really be that there is a television show about the life of a fat woman? A show which illustrates the dimensions of her personality? Her daily struggles to fit into society like a thin person might? I kept reading. It turns out that this show is going to chronicle her “weight loss journey” to become, in her words, “skinny.” Is it so much to ask that we could have a fat woman be the center of a television show who is NOT trying to lose weight? Showcasing a secure, self-loving fat woman (or man) in a lead or romantic role (especially with a thin partner) will always be “controversial” until someone bites the bullet and just produces something. Unfortunately, I am barring independent films from what I’m saying– as well as they may mean, independent films simply are not going to reach the masses of the world like a major production might. I went to the official website for this show (link above), and started watching the previews and nosing around. Even if the main plot centers around her weight loss, should the show bring light to her inner workings and struggles, the show would do some good. The videos were hard to watch, and the “Getting Healthy” and “Living Large” were problematic in places as well. Starting off with the videos: all three I watched featured that cheesy, piano-y, “inspirational” music. Not only does this set the stage for an ugly ducking-to-swan-like story, but it also creates a sense of pity for Ruby. She’s shown as being quite active, though– there are clips of her dancing and going to the gym, and also walking her dogs. Ruby’s voice is played over the music, saying various things that, frankly, made me very sad. The first quote is depressing. Surely, many fat people have felt this way. Perhaps I am fortunate to have found the communities I’m involved in at such an early age (I became involved in the SA/FA movement at 15), but Ruby appears to be at least in her 30s. Has no one told her she’s beautiful? If that is the case, it’s incredibly saddening. She IS beautiful. I’m envious of her looks and smile, even just from the images I’ve seen of her just now. As for the second quote, well, a lot of people can’t cross their legs. I know I can’t, and I never could. Even when I was very young and on the swim team (and pretty skinny, looking back), I could never cross my legs. My leg muscles were too developed. Assuming I got down to a “normal” BMI, odds are I would still be unable. I know a lot of people who are not ever going to be able to cross their legs. It’s a shame that this action has become a symbol of femininity, when, much like other symbols, it’s unattainable for some/many/the majority of women. Of all three quotes, though, the last is the worst. Ruby talks about a man who wanted to marry her. He tells her he will if she loses weight, and eventually leaves her. She says, in the video, that she realized she really loved him after he left, and that if she couldn’t lose weight for him/true love, then something really MUST be wrong with her. This really highlights the critical issues with females, the media and what we do to ourselves. Something is wrong with YOU because someone ELSE could not accept and love YOU for YOU? How is that your fault? Moreover, how could you love someone who would leave you because you were unwilling to change yourself? Women do this to themselves far more than men. Where are the women who are brave enough to realize that the fault does not lie with them? It would be wonderful to see women who don’t succumb to the guilt society heaps on this gender. At any rate, it becomes obvious Ruby has some self-confidence issues through this segment. The “Getting Healthy” section also shows problems. I’ll start by saying I’m not in any way against weight loss: people need to own their bodies and be responsible and healthy. However, this is not tied to weight alone. This section focuses pretty much only on fat loss, though. “Setting Goals” talks on and on about setting “realistic” ten-pound goals. It’s really a shame. There was nothing to be found about other types of goals: jogging for an hour without stopping, being able to scale four flights of stairs without getting winded– things that show improved cardiac health. The video clips had cleverly placed sound bites of doctors telling Ruby that she was headed for strokes, loss of vision, loss of leg function, etc. Nothing had been said about her having or being pre-Diabetes, so I infer that she’s getting the usual no-no speech from a practitioner. Of course, that won’t really be known for sure until the show is aired. The only part of the dieting section that I was impressed with was the five-week sample menu that Ruby is supposedly consuming. I actually got hungry reading some of the items! Unfortunately, it’s pre-packaged food from a Jenny Craig-like diet center. Personally, I’d rather cook the stuff myself. A lot of it would be amazing when freshly prepared. All and all, the show makes me nervous. I want to think it will do some good– maybe show people that being fat is not quite the horror many make it out to be. Will Ruby have difficulty losing weight? It does say in her “About Me” that she has been fat as long as she can remember. And I guess, if it came down to it, I’d rather see this than MTV’s Model Makers. Uh-Oh! Bed Bath & Beyond knows women can’t control themselves! This morning, I went out front to grab the mail. The only thing in there was this week’s Bed Bath & Beyond circular. Seeing as I am still without employment, I took an idle and semi-uninterested glance at the cover. Immediately, I felt shock and disgust course through my system. Perhaps you can see where I’m going with this? First, of COURSE it will be a woman on the scale. On occasion I will see males used in weight-related jokes or schemes, but nine times out of ten, it’s a woman. Let’s rewind a second and look at most of the food. Lean turkey (breast). Carrots. Cranberries, Asparagus. This is healthy food. Yes, there is some cheese and gravy present, but the amount shown wouldn’t even reach the bottom of the chafing dish. Yes, I think we can all agree that there’s nothing reduced-calorie about the desserts, but they are also seemingly small in size. Even having one of each variety is not going to result in a catastrophic weight gain. 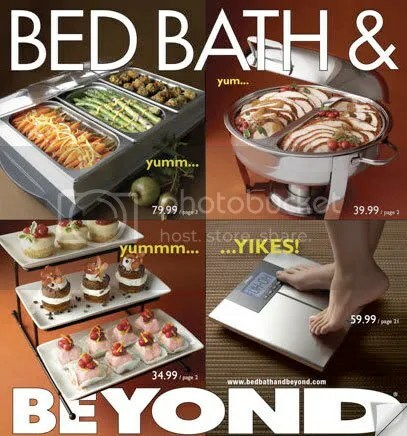 And even if you do gain five pounds, is “YIKES” appropriate? Seriously? Your world is not going to crumble. This circular’s cover reminds me of magazines like Woman’s Day: a picture of a beautiful cake on the front, with the headline, “LOSE 23 POUNDS WITH POWER WALKING!” Translation: make a cake for your family while you eat celery and work out every day. Or the Special K ad where a mother and child are icing a cake. The mother goes to lick some cake batter from her finger, and then a voice comes on: “you’re about to undo your whole day.” With a lick of cake batter, really? Oh yes, puffed rice flakes with tiny bricks of vegetable oil and chocolate flavoring is really on par with cake batter. That’ll DEFINITELY get rid of your craving. It’s sickening how often women around food is correlated with some kind of lack of control. Women are bad drivers, women are too emotional, women can’t have a normal relationship with food. NATURALLY, if a woman is around a dessert plate, she will eat ALL of the items, resulting in a weight gain (shown on her shiny new digital scale) that will surely end her life. The reality is that a plate of the food shown on this circular would not greatly affect one’s weight. And then, at the notion it MIGHT cause one’s weight to increase, negative imagery is used. ‘Cuz, y’know, God forbid. You might get the Diabeetus. I’m gonna get it for this. Some of the things others are reading into the game are a little out in left field to me, as well. Maybe she’s not helpless when faced with cake. Maybe she ran away to the opposing kingdom’s castle and wants to stay there and eating copious amounts of cake is the idea they all came up with. Then, there’s the idea that there is some kind of fat joke underlying the whole game. I haven’t seen any articles elaborating on a plot in the game, so I can’t say if there even is one. I doubt there is, so really, all this about fat jokes and women and food and everything is speculation. Everything I have read about the game thus far shows it to be relatively simple, almost like Capture the Flag with a fat chick instead of a little pennant. Besides, the game could awaken a whole new generation of fetishists. Sexual deviance makes the world interesting. That wouldn’t be so bad, right? Or, is that just as bad as those who laugh at fat people? People don’t generally make video games to influence the masses. There are, of course, exceptions, but for the most part, creators just churn ’em out. The developers for this game may not even be aware of the message some are gleaning from this game. Maybe they thought it was harmless. It would be great to see an interview with them, though, and maybe that’ll happen in time. Maybe there are just bigger fish to fry, I think.